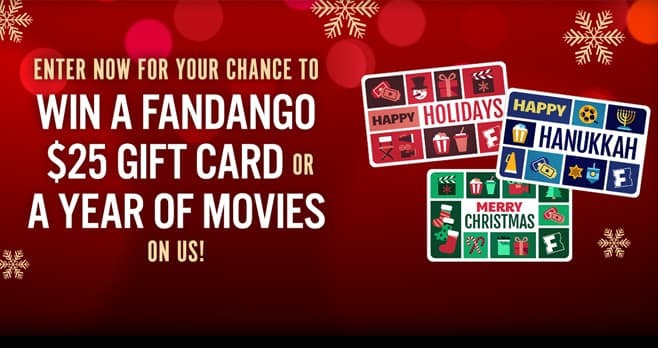 Fandango is celebrating the holidays by offering you the chance to win a Fandango $25 gift card or a year of movies during the Holiday Daily Gift Card Giveaway & Movie Sweepstakes. Register by December 31, 2018 for your chance to win. The Fandango Holiday Daily Gift Card Giveaway & Movie Sweepstakes is open only to legal residents of 49 states of the United States and the District of Columbia (void in Rhode Island, Puerto Rico, all U.S. territories and possessions and all overseas military installations) who are at least 18 years of age (or the age of majority in their state of residence, whichever is older) as of December 14, 2018. The Sweepstakes begins at 12:01:00 a.m. PT on December 14, 2018 and ends at 11:59:59 a.m. PT on December 31, 2018. The grand prize consists of twenty-four (24) $25 Fandango Gift Cards. Visit www.fandango.com/sweepstakes/holidaydailygiveaway to enter and see Official Rules for details. Christmas Movie My House Contest : Win a $75,000 Grisworld Family Christmas Home Makeover!